VIDEO: Warriors vs. Thunder Game 6 Full Highlights - 2016 NBA Western Conference Finals - Balita Boss! 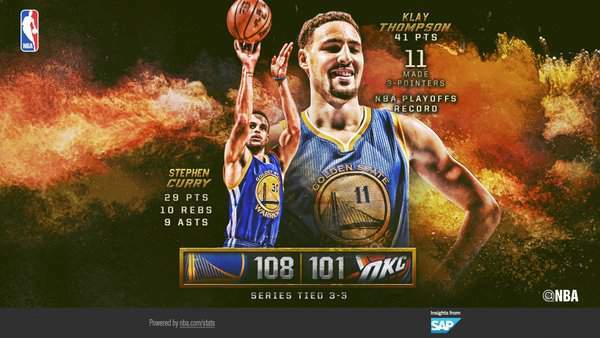 The Golden State Warriors have forced Game 7 in the 2016 NBA Western Conference Finals with a 108-101 victory over the Oklahoma City Thunder in Game 6. The backcourt duo of Stephen Curry and Klay Thompson led a huge Warriors comeback in the fourth quarter. Thompson, who set an NBA playoff record with 11 three-pointers, scored a game-high 41 points, shooting 14-of-30 from the field. Curry, the 2016 NBA MVP, flirted with a triple-double as he put up 29 points, 10 rebounds and nine assists. Kevin Durant scored 29 points on 10-of-31 shooting, including 1-of-8 from three. Russell Westbrook added 28 points, 11 assists, nine rebounds and four steals for the Oklahoma City. The Warriors knocked down 21 triples—shots while Thunder shot 3-of-23 from beyond the arc. The defending champion, who set the league's regular-season record with 73 wins, will host Game 7 on Monday (Tuesday in the Philippines). The winner will play Cleveland in the NBA Finals.